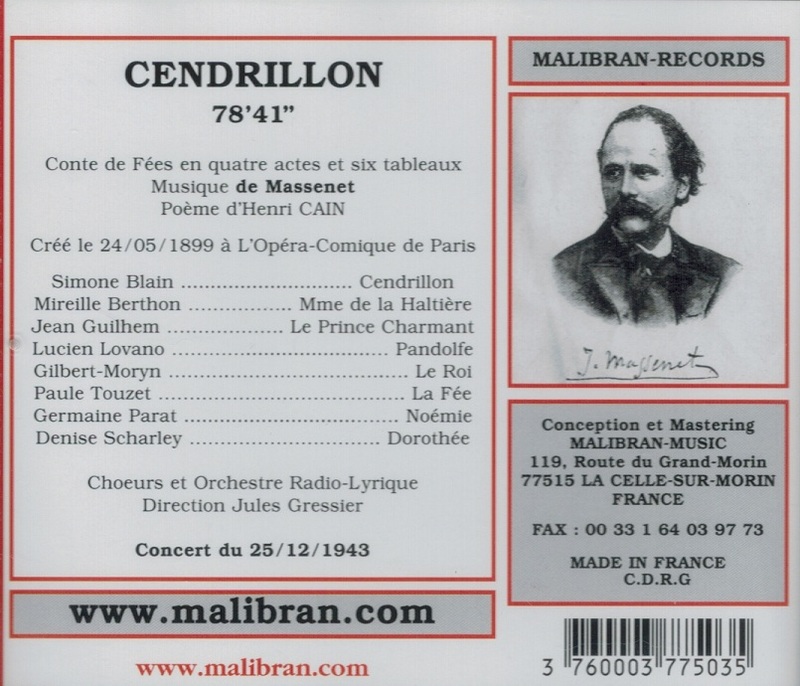 “CENDRILLON (Cinderella) is an opera—described as a ‘fairy tale’ by Jules Massenet to a French libretto by Henri Caïn based on Perrault's 1698 version of the CINDERELLA fairy tale. It was given its premiere performance on 24 May 1899 in Paris. The New Grove Dictionary of Opera notes that Massenet's sense of humour and wit is more evident in this work, and the use of recurrent motifs is more discreet, while the love music ‘reminds us how well Massenet knew his Wagner’. Albert Carré (director of the Opéra-Comique and producer of the first staging) persuaded the composer to drop a prologue introducing the characters, but a brief epilogue survives. 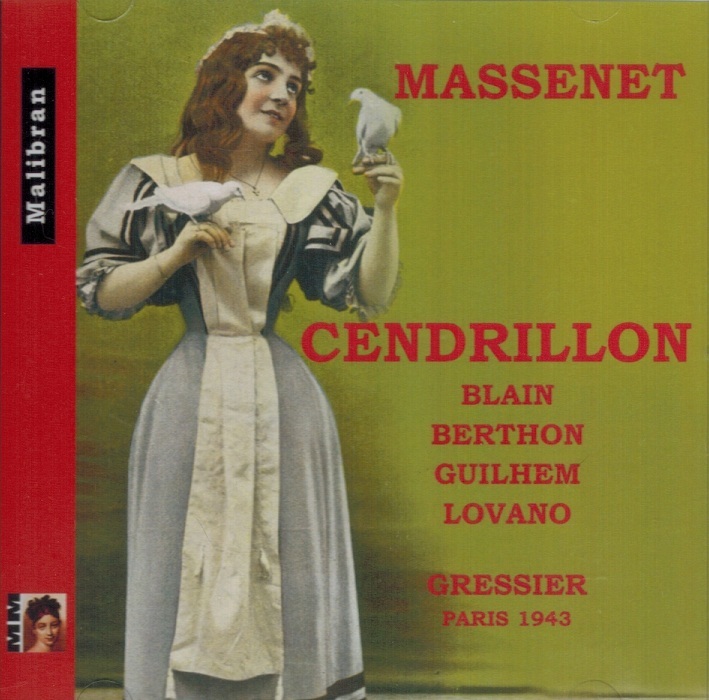 Another writer comments that Massenet’s perfectly proportioned score moves from a scene worthy of Jean-Baptiste Lully's ARMIDE (in Cendrillon’s monologue), through Rossinian vocalises and archaic orchestrations to ballet movements on a par with Tchaikovsky. The scenario was conceived by Massenet and Cain when they were in London for the premiere of Massenet's LA NAVARRAISE in June 1894. The composer began work on the score in Pont-de-l'Arche, with the final touches being made in Nice in 1895/96. 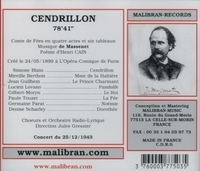 At the time of the premiere, Massenet had announced in LE FIGARO that CENDRILLON would be his last lyric work. The autograph score is dedicated to ‘Mademoiselle Julie Giraudon’, who subsequently married Henri Cain. As one of the first operas to be produced at the newly-rebuilt Salle Favart (the third theatre of that name and the home of the Opéra-Comique), it enjoyed the modern facilities provided during the refurbishment, including special effects on stage and electricity throughout the theatre. Massenet took a close interest in the first production, attending 60 out of 98 rehearsals at the Opéra-Comique prior to the premiere. The first performance was given at the Opéra-Comique in Paris on 24 May 1899, at the height of Massenet's success."